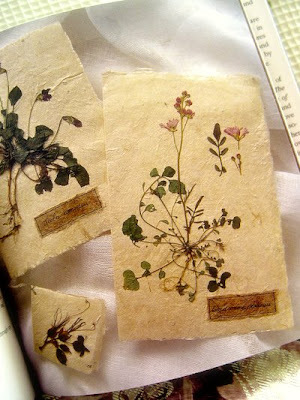 Penny Black suggests collecting all sorts of botanicals that are pressed for future use. She dries both cultivated and wildflowers for these projects, as well as leaves, herbs, and grasses. She also suggests using miniscule pressed vegetables like baby carrots, newly formed peas and beans, thinly sliced red cabbage, sliced okra, onions, baby sweetcorn, watercress sprigs, mustard and cress, alfalfa sprouts and slices of globe artichoke. Thinly sliced fruits like alpine strawberries and crab apples work well. Mosses and lichens are also a beautiful addition to dried cards and collages. Paper-thin barks and herbs like cloves, whole cardamom, star anise, allspice, peppercorns, and pulses are also useful. Sometimes other non-botanical items can be used to supplement a design. Tiny sea shells, sequins, metallic threads, glass and wooden beads, and thin silk ribbons all add beautiful touches of embellishment.